Before Jesus Wells are drilled, people in many communities gather water from ponds and rivers because they have no access to a clean, safe water source. 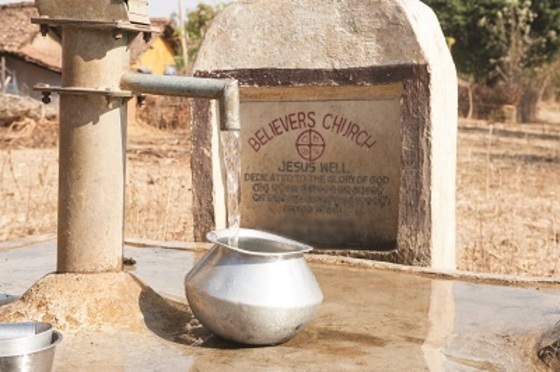 For Christians in Muralee’s village, their water sources were barred to them because of their faith in Christ—until a Jesus Well was drilled in their community. It was April, and 200 people had gathered for what should have been a joyous celebration. The bride and bridegroom were dressed in their best, ready to start their new life together. These men and women were Christians, and their pastor’s life had been threatened for wanting to worship Jesus with others. Hostility and ostracism became pervasive, and on the day of the wedding, when the believers went to get water for the ceremony, they couldn’t. The other villagers had decided to ban the Christians from the village’s wells, though the wells were unreliable to begin with. But water was needed, and they had no other resource to fulfill this last-minute need. GFA-supported pastor Bhuman and other GFA-supported pastors and believers attending the wedding gathered in the marriage house to ask God for help. Fifteen minutes passed when Muralee, a man who lived in the village, heard about what was going on. With Muralee’s water well, the wedding went on, but the incident only highlighted a greater issue of water scarcity in the village. Pastor Bhuman began asking the Lord to provide a Jesus Well—a prayer he continued for three months. Before the Jesus Well was drilled, many people in Muralee’s village gathered their water from ponds and rivers. During monsoon season, they collected rainwater from their roofs and stored it. This water would carry them through the inevitable dry season when ponds, rivers and wells frequently went dry, a situation that had only worsened through the previous five years. But the Jesus Well solved their water problems! Within a week of the drilling, people who had been upset at the wedding came to understand more of Christ’s generous, loving heart. When they fell ill or struggled, they started asking Pastor Bhuman to pray for them, and God moved. That’s how Pastor Bhuman and the believers learned about the plight of a man named Digambar. Digambar had started limping one day while walking home from his relatives’ house. His limp gradually grew in severity until he couldn’t even walk. Pastor Bhuman and several believers went to Digambar’s house to pray for the paralyzed man. Their visits and prayers continued for nearly a month. And God answered! Digambar can walk again, and he doesn’t even need the help of a cane to do so. Experiencing this miracle, Digambar and his family have decided to walk with the One who enabled him to walk again. We praise God for how He moved in so many lives through this Jesus Well and the faithful service of Pastor Bhuman. What started as an interrupted wedding led to the restoration of many hearts. Thank you for your part in making stories like this possible through your prayers and support!